There’s a simple and obvious logic to pairing batteries with solar power: capture solar energy when the sun is shining, and then use it when the sun goes down. But the economic realities of the commercial-scale solar-plus-storage projects being deployed today don’t often match up with that seemingly simple proposition. That’s clear from taking a close look at four utility-scale solar-battery projects announced in the past two weeks. Only one, a 17-megawatt solar PV array with 52 megawatt-hours of lithium-ion batteries being built by SolarCity on the Hawaiian island of Kauai, is intended for long-term shifting of solar power from midday to evening. That business proposition makes sense for a co-op that’s trying to replace expensive diesel-fueled generation with a clean alternative. But with three other projects on the mainland in Texas, Ohio and Georgia, very different economic imperatives apply. There’s plenty of low-cost coal-fired and gas-fired power for these grids to draw from, and batteries are still too expensive to compete with those alternatives. That means the economic opportunities for these projects will be the same ones that work for standalone energy storage systems today: frequency regulation, peak shaving, asset deferral, and other well-defined use cases. These three battery projects are still taking advantage of the benefits of co-locating with solar power, however. Those include a lower cost of siting and grid interconnection, taking advantage of soon-to-expire federal investment tax credits to lower the cost of the batteries, and in some cases, actively managing batteries and solar as a single, grid-connected resource. GTM Research projects a $1 billion U.S. market for battery-backed solar PV systems by 2018, with much of the growth to come in “front-of-meter” applications at utility scale. Here’s how some of the earliest commercial-scale projects in the arena are approaching the market. Take S&C Electric Company’s new 7-megawatt, 3-megawatt-hour battery system being built for the municipal utility of Minster, Ohio. S&C is teaming up with Half Moon Ventures, which will tie the batteries to its 4.2-megawatt PV solar array. “This project is standing on its own. There’s no money coming from outside sources, no money from the government,” Troy Miller, S&C’s grid solutions director, said in an interview this week. That’s a critical distinction from almost all the existing utility-scale solar-storage projects out there today, which have used government grants or research funds to avoid the tricky question of whether the projects can stand on their own, financially speaking. To make that happen, S&C and Half Moon Ventures have targeted four specific economic value streams. First, they’ll play the batteries into mid-Atlantic grid operator PJM’s frequency regulation market -- the primary market for most of the country’s deployed megawatt-scale battery capacity today. Second, S&C will use its storage management system to improve power quality, inject reactive power, and otherwise manage conditions on the distribution grid where the solar farm is connected. That will allow Minster to avoid deploying grid gear to handle those same issues. Managing this solar-grid interconnection is one of the key goals of another project announced last week by utility Southern Company. It’s a 1-megawatt, 2-megawatt-hour battery from LG Chem, with power conversion and equipment from grid giant ABB, co-located with a 1-megawatt solar PV array connected to the medium-voltage distribution grid in Cedartown, Georgia, operated by Southern Co. subsidiary Georgia Power. The final partner in the project, the Electric Power Research Institute (EPRI), is using this combination to “investigate whether there’s a natural advantage of putting storage with solar,” Haresh Kamath, EPRI program director for energy storage and distributed generation, said in an interview this week. “This may be used as a model for how we’d implement storage in places like these in the future to solve problems,” such as two-way power flows and voltage fluctuations. 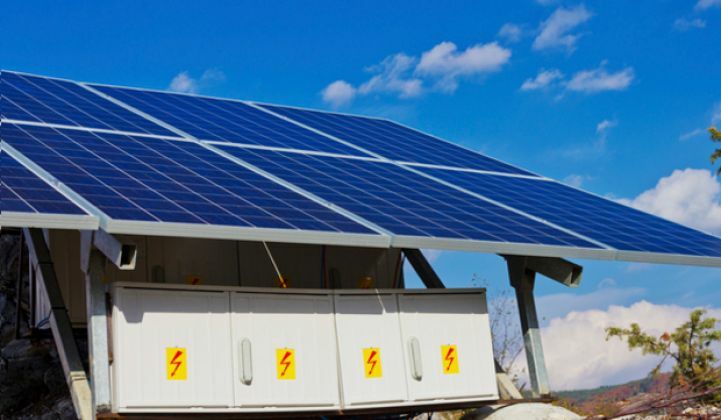 EPRI is also working with its partners to standardize the approach to siting, interconnecting and operating batteries alongside solar installations, he said. “A lot of the work around this project is targeted at reducing these soft costs,” through standards like the EPRI-developed communications protocols for how solar and battery inverters talk with utility control systems. “People have talked about this for a long time, but it’s never been achieved at the distribution level,” said Kamath. Even so, utilities like Southern California Edison are already starting to demand standardized plug-and-play battery systems from vendors to deploy quickly into evolving grid-upgrade plans, and bringing solar-storage systems on-line quickly and cheaply will also require this kind of standardization. The project is mostly funded by Southern Co., though an EPRI-led group of utilities have also contributed money. “We’re looking to take this information and disseminate it to other utilities, and across the industry in general," said Kamath. Standardized storage is also a part of the third project announced last week, this one in Texas. Solar developer OCI Solar will be using the Y.Cube systems launched by German startup Younicos last week, which combine batteries, power conversion hardware and control software in 250- or 500-kilowatt units. Those systems will be built into a 1-megawatt lithium-ion battery to be sited alongside one of OCI’s several solar farms being built in the territory of Texas grid operator ERCOT. For the past year or so, Younicos has been running the 36-megawatt Notrees wind farm battery array owned by Duke Energy, which gives the startup a good deal of experience in how to manage storage in the ERCOT market, spokesperson Eugene Hunt said in an interview this week. But the companies are keeping quiet right now on just what economic values they’ll be seeking to capture with the battery array, and how they will relate to the economics of solar. “We haven’t released any final details on this,” Laura Waldrum, communications manager with OCI Solar parent company OCI Energy, said in an interview this week. OCI’s solar projects in Texas range in size from 5.5 megawatts to 110 megawatts, but it isn’t disclosing which one will get the new battery.